There’s been no shortage of handwringing over President Donald Trump’s plans to meet one-on-one July 16 with Russian President Vladimir Putin — and for good reason. The last time an American president went mano a mano with Putin was when President Barack Obama confronted the Russian strongman over his ongoing assault on our democracy. We can expect Trump — the byproduct of that assault — to take a very different approach. More concerning than the bonhomie that presumably will run through that session, however, are the disastrous deals our supposedly deal-making president, without adult supervision, could agree to. After all, it was almost exactly one year ago that Trump heralded an “impenetrable Cyber Security unit” he and Putin were planning — which turned out to be among the shortest-lived of Trump’s deals. Sen. Lindsey Graham called that agreement “pretty close” to the dumbest idea he’d ever heard, while Sen. Marco Rubio likened it to partnering with Syrian strongman Bashar al-Assad on chemical weapons. Within hours of announcing the purported breakthrough, Trump returned to Twitter to claim, dubiously, that he never actually believed the unit could come to pass. While that particular bad idea may be dead, Trump’s well of bad ideas runs deep, especially where Putin is concerned. And there’s one particularly dangerous idea that the Russian leader will almost certainly raise and which will likely appear especially alluring to Trump: a pledge of mutual non-interference in each other’s political systems. Such a proposal would present Trump with precisely what he seeks — a deal that sounds good on its face and that would electrify his political base — but that would have disastrous implications for America’s foreign policy and credibility on the world stage. Proposals of mutual non-interference have long been a staple of Moscow’s foreign policy. Sometimes they’re thinly disguised — as was the case with a 2011 Russian proposal to the United Nations that would have prohibited countries from using information technology to interfere in other states’ political affairs. Other times, they’re clear as vodka, as was the case when Moscow proposed just such an agreement to the Trump administration at least twice last year. There’s one particularly dangerous idea that the Russian leader will almost certainly raise and which would likely appear especially alluring to Trump: a pledge of mutual non-interference in each other’s political systems. 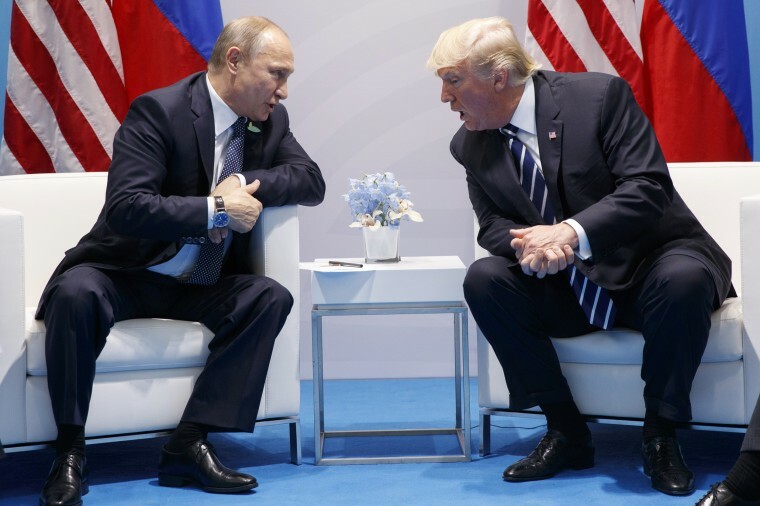 Moscow, by its own admission, attempted to slide non-interference language into the joint communique that emanated from Trump and Putin’s meeting last July. Russian officials resuscitated the proposal late last year, before it was killed by the State Department. National Security Council officials appeared careful at the time not to acknowledge whether Trump himself had been aware of that second proposal. Nevertheless, this time could be different. Putin will have an opportunity to pitch his American counterpart directly and privately, and he could do it in such a way that would appeal to Trump’s most Trumpian instincts. Putin almost certainly would market a non-interference pact as a win-win: Trump — who has endured withering criticism for failing to confront Putin’s attack on our democracy — would be able to emerge from the summit shouting to the masses that Russia would never again meddle in our elections. But here’s the rub: While the upsides for Trump would be obvious, the less visible downsides for the United States could verge on the catastrophic. For starters, the “pledge” from Moscow would be worth less than a devalued Russian ruble. After all, Putin and his cronies continue to deny the undeniable: that Russia was behind the assault on our democracy in 2016 and continues to attack our political system in the run-up to the 2018 midterms. The Kremlin assuredly would not feel bound by any agreement Putin reached with the U.S. president he helped install — especially when any such operation could again be conducted covertly and deniably. Just as importantly, however, the Russians have an expansive definition of “non-interference,” which would do far more than preclude Washington from, for example, hacking and releasing the emails of Putin or his apparatchiks. Indeed, Moscow routinely accuses Washington of “interfering” in its political system for doing nothing more than what’s in our American DNA: speaking out, openly, in support of human rights, civil liberties and basic freedoms. Indeed, Putin still holds Hillary Clinton responsible for a wave of popular protests he faced in 2011, after she criticized Moscow’s less-than-free-and-fair elections as less-than-free-and-fair. Russia also routinely takes aim at U.S. funding for democracy initiatives — both within Russia’s borders and along its periphery. The State Department’s “Internet Freedom” initiative has been a perennial bogeyman, even as the United States has scaled back its pro-democracy initiatives in and around Russia. Moscow expelled the U.S. Agency for International Development for its pro-democracy work back in 2012. In essence, then, any such agreement would virtually require the United States to shelve the principles and values that have guided our foreign policy for the past seven decades — both with regards to Russia and its broader perceived sphere of influence. In other words, America would be relegated to biting our tongue in the face of Putin’s worst excesses. Far from finding this objectionable, Trump — who has made a habit of apologizing for Putin and abdicating America's moral responsibilities on the world stage — would almost certainly embrace these limitations as a feature of any such agreement, rather than a bug. Time and again, Trump has placed his standing with his political base over America's international standing, credibility and even our national security. He did this most recently by claiming to have solved the North Korean nuclear challenge, despite accomplishing nothing but unburdening Kim Jong Un of the international diplomatic pressure the North Korean dictator — and his still improving nuclear infrastructure — previously faced. When Trump meets with Putin, he’ll almost certainly be presented with another proposal that would allow him to burnish his credentials with his base while eroding America’s integrity and authority the world over. In Helsinki, Trump needs to find a way to put his country’s best interests over his own. If we’ve learned one thing during the Trump era, however, it’s that there's little reason for optimism.